Read Divergent. Sort of done? I started reading it in December 2013 but didn't actually finish it until January 2014. Complete the Australian Women Writer's Challenge. Done! Buy Some Bookshelves. Another "sort of done." I did get some new shelves, but not until this year. Go to the Library. This one was mostly a fail. Most of my reads this year have been books I already owned, which was actually a good thing because some of them had been sitting around for ages. Finish my Goodreads Reading Challenge. Man, this is the first year I'm in danger of not finishing, and the perfectionist in me is screaming, "Nooooooooo!!!" I think I'm about 5 books behind at this point, which is a little scary. I'm hoping to catch up on some reading this weekend, but whenever I say that, I end up doing everything but reading. Complete the Australian Women Writer's Challenge. I still have 2 books to go on this one, which is 1 more than where I was last year at this time, but I think it's still feasible. Read Soulless by Gail Carriger. This goal is dedicated to Ally, who's been begging me to read this for forever. I shall do my best. 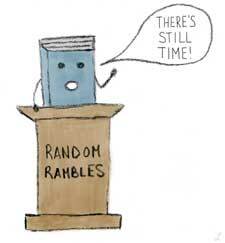 How about you—any last minute bookish things you're trying to squeeze in before 2014 ends?